Program Concludes at 9:45 a.m.
National Philanthropy Day acknowledges the entire spectrum of services provided by the non-profit community and recognizes the profound impact that philanthropy has on the fabric of society. 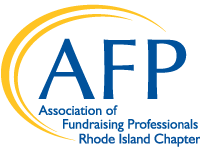 Each year, the Association of Fundraising Professionals – RI Chapter (AFP-RI) honors individuals and groups who, through their hard work and dedication, have enhanced philanthropy, their communities, and the world. Awards are presented for Outstanding Philanthropic Citizen, Business, and Corporation with recognition given to more than 50 Partners in Philanthropy. The Herbert E. Kaplan Youth in Philanthropy Scholarship is awarded to a local high school senior who exemplifies the qualities and characteristics of a young philanthropist.